Greenwich Market's Late Night Wednesday Arts & Crafts Gift Market will take place on 5th, 12th and 19th December from 11am to 8pm. 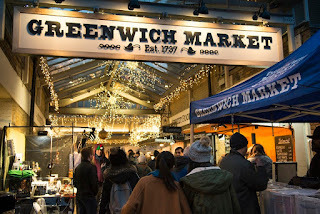 It's the perfect place to find those unique gifts together with delicious street food, music and mulled wine. And don't forget Santa's Grotto at the Market, every weekend in December plus Thursday 20th, Friday 21st and Christmas Eve. Visiting Santa costs £5 per child, raising funds for Greenwich & Bexley Community Hospice.